On New Year's Day, Lisa, Anlon and I skipped through "The Incredibles" to land on the edibly snarky snippets featuring Edna, the pint-sized designer whose larger-than-life proclamations evoked Diana Vreeland crossed with Mr. Magoo. While Vreeland once exclaimed that pink is the navy blue of India, the computer-generated Edna scolded silly visitors not to distract her from the now. In tribute to Edna, I've decided to give my own SoCal fashionista spin on such maxims. The Year of the Pig is about the color pink, love and barter economies, I say. It's also about seeking new adventures. Even more than last year? Yes! Because if you tell yourself that this year you will have the time of your life, meet the love of your life and be the most fabulous in your life, then you will wake up every day happy, positive and optimistic. And even on Dec. 31, if you realized that none of that came true, then at least you know that you did the best you could and had loads of fun. I kicked off New Adventures 2007 by going to my first tailgating party and motocross competition. The BBQ was a Mexican fiesta with Coors Light and PBR, courtesy of an action sports company. Missy, her hubby Cory and I wandered the packed parking lot of Angel Stadium in Anaheim for nearly half an hour in search of the black RV. We were told to look for the floating blimp bearing the company's logo. Our search was in vain, for the RV was decorated at the last minute with beach umbrellas instead. Still, it was a good time. This is the racetrack for the Amp'd Mobile Supercross competition. There was even a three-lap competition for 7- and 8-year-old bikers. I think my favorite racer is James Stewart. You can't go to a stadium sporting event without eating some bratwurst. The one on the right is mine, topped with sauerkraut, onions and peppers. Missy ordered the Italian sausage with peppers. She stole some of my sauerkraut. I was very lady-like in eating the bratwurst with a plastic fork and knife. 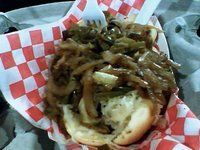 Dotted with fried onions, the roll served as a cushy pillow for the sausage and toppings. When I told Missy that we forgot to get paper napkins, Cory, who was sitting between us and munching on his nachos, said we could wipe our greasy mitts on his pants. 0 Response to "Motocross Meal"